Eric Chester has written the definitive guide for attracting, developing, and retaining great employees, while also providing actionable and proven strategies for getting them to work as if they were co-owners. On Fire at Work flies in the face of other books on workplace culture by showing that employee engagement isn't the ultimate goal--it's merely the starting point. Renowned leadership expert Eric Chester has gone straight to the source--top-tier leaders of the world's best places to work to uncover their best practice strategies for getting employees to work harder, perform better, and stay longer. 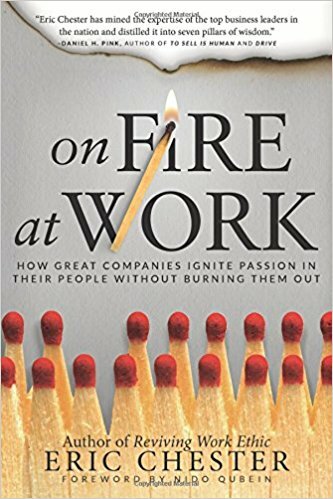 On Fire at Work features examples and original stories from exclusive personal interviews with over 25 founders/CEOs/presidents of companies like Marriott, Siemens, BB&T Bank, Wegmans, 7-Eleven, Hormel, Canadian WestJet, Ben & Jerry's, and The Container Store, along with smaller companies like Firehouse Subs, the Nerdery, and Build-A-Bear. The guiding principle is that any organization in any industry--from Fortune 500 firms to mom-and-pop shops--can learn how to bring out the very best in their employees. The book's content-rich research and conversational case study-based narrative make it a timely, actionable go-to reference on employee performance and productivity for C-level execs, corporate and government managers, HR professionals, and small business owners. On Fire at Work is a practical field guide that any organization can implement to build, not an engaged workforce, but a workforce that's on fire!